(Wired) -- Early demand for the Nissan Leaf electric vehicle is strong, with 6,635 people reserving cars in just three days -- a figure that represents more than 10 percent of the Leafs Nissan will build in its first year of production. Nissan started taking reservations for the four-door, five-passenger EV on Tuesday afternoon, and almost instantly people were signing up to get one. The Nissan Leaf, which will cost $25,280 after the $7,500 federal EV tax credit, rolls into showrooms in December. "We had 2,700 reservations in the first three hours," said Dave Mingle, Nissan's senior director for customer management and business strategy. "It exceeded what we expected, though we knew from what the hand-raisers were telling us this is an exceptionally passionate crowd." The hand-raisers he's referring to are the 117,000 people who registered at the Leaf website to get a place in line once the reservation system opened. Those who have made reservations paid $99 to make sure they're on the list when the Nissan Leaf starts appearing at dealerships. Mingle said interest has been strongest in the "smile states" of the East and West coasts and the South. 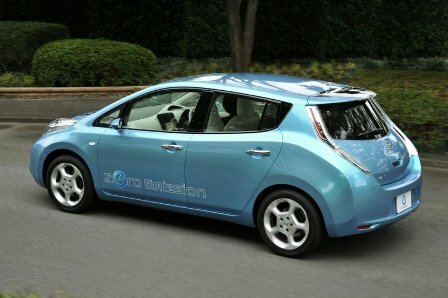 TheLeaf will be available only in selected areas to start -- California, Oregon, Seattle, Phoenix-Tucson and east-central Tennessee -- but Nissan plans to roll it out nationally by the end of 2011. Not every car will be delivered in December, of course; they'll be delivered as they're available. Nissan has the capacity to build 50,000 Leafs in the first year, but it is not yet known how many of those are slated to arrive in the United States. Given that more than 3,700 people in Japan have reserved Leafs, about 20 percent of the first year's production is spoken for. 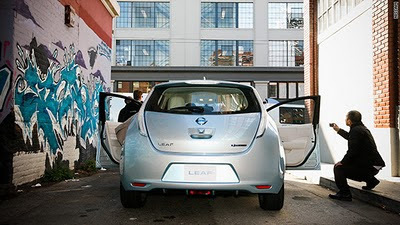 EV advocates have said Nissan has priced the Leaf so competitively -- it's comparable to the Honda Civic and Toyota Prius -- that it could have trouble meeting demand. That remains to be seen, of course, and Nissan isn't making any predictions. But it's pleased with the demand so far. "It's been pretty fast and furious," Mingle said. And by the way, Nissan insists the plural of Leaf, at least as far as the car goes, is Leafs.